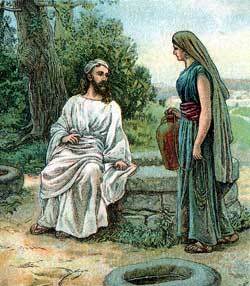 Jesus tells the Samaritan woman, "Whoever drinks of the water I give them, will never thirst again." ETWEEN JUDEA AND Galilee was a little country called Samaria. This country used to belong to the kingdom of Israel; but when the Israelites were carried away as captives by the king of Assyria, strangers from other lands came into that country and made their homes. These strangers learned about the God of the Israelites, but they never worshiped God at the temple in Jerusalem. Instead, they built a temple in their country and worshiped there. They became bitter enemies of the Jews, and at the time of Jesus they were still despised by the Jews. In going to or returning from Jerusalem, the Jews of Galilee usually would not take the shorter road, through Samaria, but would travel the long road, which led first to and across the Jordan River, then along the border of the land where the people lived whom they despised. Although Jesus was a Jew he did not share the bitter feeling of the Jews toward the people of Samaria, who were called Samaritans. He knew they were just as precious in the eyes of God as were any other people, and he longed to teach them about their country on his journey back to his home in Nazareth. Because Jesus wished to take the shorter road, through Samaria, his disciples were willing to go that way too, in order to be with him. So they journeyed together as far as a little city called Sychar. Near the city was a wayside well, which had been dug hundreds of years before probably by Jacob, the grandson of Abraham. And in honor of him it was still called Jacob's well. When they reached this well, Jesus was tired, and sat down by it to rest from his long walk. His disciples went on to the city to buy food, leaving him there alone. Presently a woman from Sychar came down to the well to draw some water. She glanced at the stranger sitting there and saw that he was a Jew. Knowing that Jews paid no attention to Samaritans, she passed by and hurried to lower her water-jug with the long rope that she had brought. When the jug was filled she drew it up and was ready to start back to the city, when Jesus asked for a drink. Surprised at his request, the woman answered, "How is it that you, being a Jew, will ask a drink of me, a woman of Samaria? for the Jews have no dealings with the Samaritans." Jesus replied, "If you knew who it is who asks a drink from your jug of sparkling water, you would ask of him and he would give you living water to drink." These words aroused the interest of the woman at once. Who could this stranger be? she wondered. She knew he was not like other Jews, for they would rather suffer from thirst than ask a favor of a Samaritan. So she said, "Sir, this well is deep and you have no rope to draw out the water, how then could you give me living water to drink? Are you greater than Jacob, who gave us this well, and drank of it himself, and his cattle?" "Whoever drinks of this water in Jacob's well becomes thirsty and returns again and again for more," answered Jesus, "but the living water which I give does not come from such a well. It bubbles up like a continual spring within one, and that one never grows thirsty again." Now the woman was an eager listener. She did not know that the living water of which Jesus spoke was his free gift of salvation to all people, and she said, "Sir, I want that kind of water so that I shall not need to return and refill my water-jug in this tiresome way." Jesus saw that she was interested, so he began to talk to her about her sins. He knew she was a very sinful woman, and he told her about some wrong things that she had done. She wondered how he, a stranger, could know these things. He seemed to see her thoughts and to read them all. "You are a prophet," she exclaimed. Although this woman was a sinner, she wondered often whether God was more pleased with the religion of the Jews than with the religion of her own people, the Samaritans. Now she asked Jesus whether people should worship God in Jerusalem or in the temple of the Samaritans. Jesus answered that God had planned to bring salvation through the Jews, but he said the time had come when true worshipers need no longer go up to Jerusalem, for they might pray to God everywhere and worship him. "God is not found in only one place," he said; "for God is a Spirit. And those who worship him in the right way must believe that he is a Spirit." Then the woman said, "I know the Messiah is coming from God, and when he comes he will tell us everything." "I am that Messiah," answered Jesus, and the woman looked in joy and wonder upon him. But at that moment the disciples returned from the city bringing food to eat, so she turned away and leaving her water-jug, ran back to tell her friends about the wonderful stranger whom she had met at the well. The disciples wondered why Jesus would talk with a despised woman of the Samaritans; but they did not ask him any questions. They brought food to him, and when he refused to eat they urged him. Then he said to them, "I have food to eat which you know nothing about." They asked each other, "Has some one brought food to him while we were away?" But Jesus knew their questionings, so he said, "My meat is to do the will of my Father, who has sent me into the world." When the woman reached the city she went into the streets and told the people about Jesus, the stranger who had understood all about her life. "He told me all the things that I ever did. Is not he the Messiah?" she asked. And the people decided to see this man for themselves, so they went with her to Jacob's well. Jesus talked with the Samaritans about the things of God, and they invited him to stay in their city and teach them more of these wonderful truths. He spent two days in Sychar, teaching the people. Then he went on his way to Nazareth, leaving behind him some believers among the Samaritans.